When you see solar on your neighbor’s roof does it make you want to go solar too? Maybe your neighbor told you his new solar system helped put a big dent in his electric bill, and you’re thinking going solar could be a nice benefit for your family too. But then you think electricity rates aren't THAT bad now. And perhaps you read somewhere that solar systems are getting better and more affordable all the time, so you are wondering whether solar panels are a good investment right now. At that point, you decide to wait and see. While we agree it’s smart to do your homework before any home improvement project, there are many immediate benefits to solar energy, so why wait? Sure, we’re a solar company and it’s our job to promote our solar systems, but read on to learn why it might be smart to go solar now. According to the time value of money concept, a dollar today is worth more than a dollar tomorrow. If we apply that to solar, that would mean going solar today may be more valuable than going solar a year from now, even if solar panel prices go down. Here’s why that’s the case. As soon as your solar system is turned on, you start generating electricity from the sun, which can lower your electricity bill. And while there are a number of factors that can influence your savings, such as location, shade, system size, utility rates, weather and local policies, the overarching principle is the same: The more solar energy you produce, the less electricity you have to buy from the utility company. So by installing your solar system today, you’re saving money now. Those are savings you wouldn’t see if you were still waiting. Purchasing a solar system outright is the best way to achieve higher long-term savings. And depending on your system size, energy usage and local utility rates, a solar system may pay for itself in five to 10 years. After breaking even through bill savings, you will enjoy free renewable electricity for the lifetime of your system — from 25 to 40 years. But not everyone has the cash to buy a solar system outright, however, and solar loan financing is a popular alternative. Many homeowners are able to offset their solar loan payment with a lower electric bill, though this varies based on the duration of the loan term and utility rate structures. With solar loans, you also get the benefits of your potential savings after the loan is paid off. Another way to go solar is with a solar lease, which can generate immediate savings, but usually doesn’t deliver as much financial savings as ownership. Lean more: FAQs About Solar Financing. And remember, that yield continues to pay off in the form of avoided electricity costs for the lifetime of the system plus resale value (see below). However, if you wait, and if interest rates go up, your loan will be more expensive and it will take longer to recoup your investment. Bottom line: If you wait too long you may end up spending more money. As for leasing, people who lease a solar system are essentially renting solar rather than buying, so rising interest rates affect them indirectly. But waiting too long can still cost you money. Higher rates mean solar companies and installers have to pay higher costs, and those costs get passed on to you. It’s 100 times cheaper to install solar panels today than it was in the mid-1970s, and according to GTM Research, utility-scale solar has seen the sharpest declines recently with a 17 percent drop, while residential solar prices have fallen by 8.6 percent. You may be asking yourself, “If solar prices keep falling, shouldn’t I wait for even lower prices?” You could, but consider this. If a solar system in your area cost $17,000 today you could save $1,462 by putting off solar for another year, assuming current cost declines continue. However, you will delay the immediate solar energy benefits, known as “opportunity cost.” Let’s say you have a $200 per month energy bill— that’s $2,400 a year in expenses that solar could eliminate (depending on system size and available roof space). 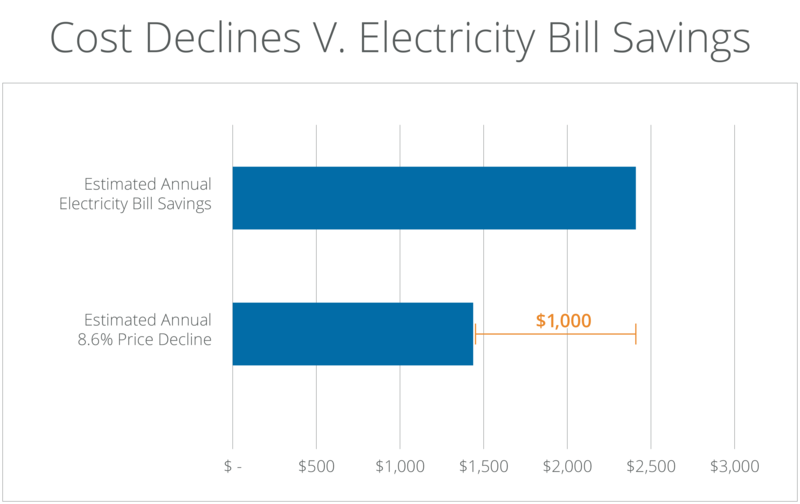 Paying $2,400 for electricity this year to save $1,462 next year puts the cost of waiting at almost $1,000. And when you factor in the time value of money concept, along with a potential utility rate hike, waiting makes even less sense. Although last year’s energy prices were stable, long-term trends show that electricity prices rise about 2 percent annually and are predicted to start increasing again this year. That means if your electricity bill is $2,400 a year, you’re looking at $2,448 the next year, $2,496 the next and so on. SunPower® solar systems have an expected lifespan of 40 years,1 so getting one now means you’ve locked in your electricity costs and could potentially save thousands of dollars over the life of your system. Buying a solar system typically adds value to your house, often with no corresponding increase in property taxes. One recent study showed that a typical solar system could increase a home's value., depending on system size and location2. Assuming a $17,000 sales price, you could possibly recoup 100% of your initial investment in home value alone. You could even use your lower monthly electric bill (or lack of one altogether) as a selling tool, assuming you own the system versus lease. Deciding between a new kitchen, bathroom or solar system? According to Remodeling’s 2017 Cost Value Report, kitchen and bathroom remodels recoup just 65 percent of their original cost based on the national average. Solar is the clear winner based on return on investment. The Solar Investment Tax Credit (ITC) is a federal tax credit for qualified tax payers who purchase solar energy systems for residential or commercial properties. The credit, which is applied to a home or business owner’s federal income tax, is equal to a percentage of the cost of eligible equipment.3 For the next two years, until 2019, solar buyers can write off 30 percent of the cost of their new solar system, which is a major benefit of solar energy. Starting in 2020, the tax credit decreases to 26 percent, reaching just 10 percent in 2021. Homeowners can also take advantage of state and local incentives for solar power, which are good but can change over time. Did you know more than 6 million deaths a year are attributed to air pollution, according to a recent New York Times report? That’s one reason countries worldwide are making unprecedented efforts to cut harmful carbon dioxide emissions by 2020, in part by reducing their reliance on fossil fuels to generate electricity. Solar is one great way to help accomplish this. According to the EPA website, an 8.6kW home solar system avoids the equivalent of an estimated 9,606 pounds of carbon dioxide being released into the air each year, doing the work of approximately 50 mature trees. If your entire neighborhood went solar, it would be like growing a forest. If you install solar now, you'll feel better every time you look up at your roof knowing that your family is doing something to benefit your finances and the environment. 1 “SunPower Module 40-Year Useful Life,” SunPower white paper. 2013. Useful life is 99 out of 100 panels operating at more than 70% of rated power. 2 Source: Hoen, B., Adomatis, S., Jackson, T., Graff-Zivin, J., Thayer, M., Klise, G., & Wiser, R. (2015). Selling Into the Sun: Price Premium Analysis of a Multi-State Dataset of Solar Homes. Based on analysis of home sales with & without solar energy systems in CA, CT, FL, MA, MD, NC, NY and PA from 1999 to 2013. Actual impact on home values will vary. 3 The solar Investment Tax Credit (ITC) is a federal tax credit for those who purchase solar energy systems for residential or commercial properties. The credit, which is applied to a home or business owner’s income tax, is equal to a percentage of the cost of eligible equipment.